It really isn't all about the ribbons. My horse show career began with a bang. I won my very first hunt-seat equitation class, which just so happened to be at an A-rated, national show. I beamed as the ring steward handed me the ribbon. Yet not every horse show that followed resulted in such a resplendent victory. I recall one moment with particular clarity. After what I figured was a flawless performance in a subsequent equitation class—riding before a judge who typically favored me, no less—I ended up with a pitiful pink fifth-place ribbon. On the way home, I sat in the backseat of my trainer’s car with my navy riding coat wadded up in my lap and my legs criss-crossed in a way that made my dusty field boots crumple around my ankles. I tried to divorce myself from my feelings of disappointment by staring out the window and watching the scenery zip past on our way back to the barn. My self-imposed exile was eventually interrupted by my trainer’s husband. He turned around from his place in the front seat and looked directly at me. In my heart, I knew he spoke the truth: I didn’t win a blue ribbon because someone’s equitation position was better than mine. It was a harsh dose of reality, yet it had a remarkable effect. If I was determined to compete, then I had to accept and embrace the entire experience. It turned out to be a wise decision, because I discovered plenty of reasons to show besides just trying to win a blue ribbon. Here are five of them. A horse show is similar to an offsite campus where you can further your education in horsemanship. Since you’re away from the comfort zone of your own arena, you’ll discover just how well you’ve actually mastered certain skills. For instance, you might be able to canter through a four-stride line at home, but can you do it over unfamiliar jumps at a show? A great deal can also be learned even when you’re not actively competing. During breaks between classes, you can watch other competitors, especially those you admire. Make mental notes on the schooling tactics they use in the warm-up ring, and listen to the last-minute instructions they get from their coaches. You really can learn quite a bit, even if it’s to discover how not to handle a particular situation. Olympic dressage medalist Hilda Gurney has said that a horse must first be trained at home; then he has to be trained to show. Anyone who’s endured the challenge of showing greenies understands the truth behind that sentiment. The socializing process that ultimately makes a reliable show horse can benefit any horse, even if he’s not destined for a career in competition. For example, hauling your horse to a local show exposes him to a variety of stimuli, from the crackle of the loudspeaker to herds of strange horses. If your horse can maintain his cool under these exciting conditions, then he’s well on his way to being an unflappable partner in more mundane settings. Rather than a competition against other riders and horses, change your perspective. 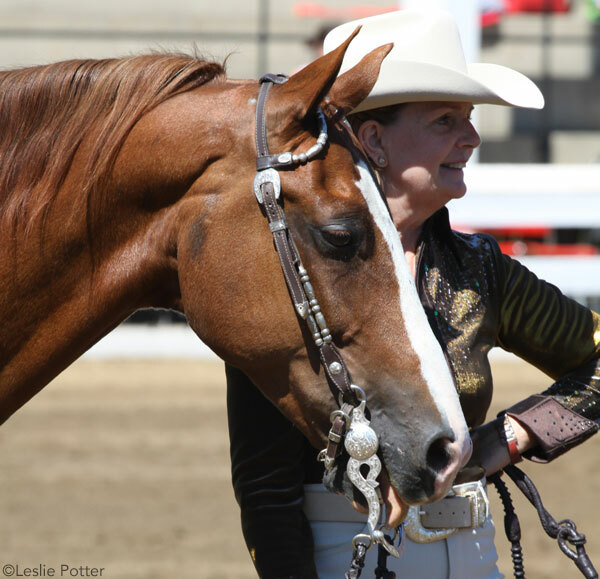 Take the viewpoint that your next show will be an exam or test that evaluates the progress you and your horse have made in lessons and training clinics. For example, if you’ve finally conquered flying lead changes at home, see if you can now achieve them while jumping a course at a show. Dressage riders have perfected this mindset, because they receive a percentage score after each of their rides. In fact, classes at dressage shows are referred to as tests. This numerical score, combined with written comments from the judge, allows a dressage rider to compare that day’s test with the one they rode at their last competition. Receiving a score of 72% on a test signals an improvement over a 68% on the same test last month. That’s the sort of validation that’s deemed important; picking up a ribbon is almost an afterthought. An integral part of showing is the Fun Factor. After all, you can’t be a ribbon winner every time, so there has to be some other avenue for enjoyment. Cultivate the fun by making shows a team effort with your friends at the barn. Take turns serving as each other’s groom, horse walker, lunch wagon go-fer, course consultant and back-gate boot wiper. Truly, showing is much more fun when you have barn buddies on your side. They’ll bolster your courage and cheer from the bleachers. And if—or when—things go wrong, they’ll commiserate with you back at the horse trailer. On those occasions when you come home ribbonless, you’ll still find satisfaction in knowing that you helped one of your riding pals achieve her goals. This type of camaraderie in competition can make memories—and friendships—that last a lifetime. 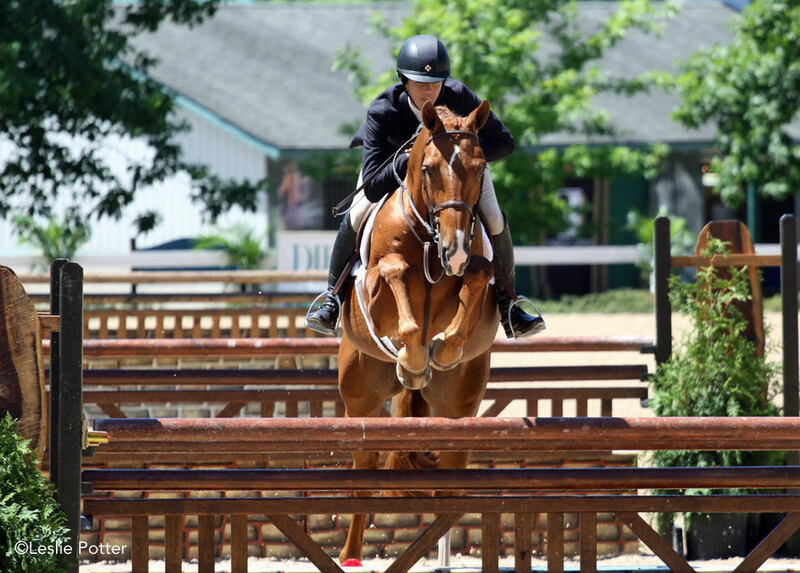 Facing your fear of jumping oxers, overcoming back-gate jitters and dealing with the disappointment of simply being outridden are horse show lessons that can be applied to life in the non-horsey world. If you can survive a season or two on the horse show circuit, you’ll also come away with the fortitude to face an injury or the ability to maintain your cool during a job interview. Perhaps most importantly, the ever-revolving prospects of being a champion—or not—at horse shows ultimately teaches you to humbly acknowledge your personal shortcomings and gives you the determination to do better. These positive character traits are rewards that will serve you better than the fleeting pride of any blue ribbon.